Nov 13, 2015 • [Source: Jessica Kershaw (DOI) & A.B. Wade (USGS)] U.S. Secretary of the Interior Sally Jewell, leading the U.S. delegation to the 2015 Ministerial Summit of the Group on Earth Observations (GEO), today signed an agreement with Mexico serving as a regional milestone for international cooperation in using land-surface satellite images for the benefit of effective land use planning and sustainability. In lead-up to the upcoming international climate talks in Paris, Jewell emphasized the critical importance of data-sharing as a foundation for global action on climate change. 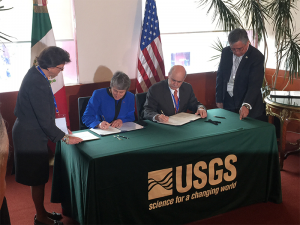 The Memorandum of Understanding signed today, for example, will enable Interior’s U.S. Geological Survey (USGS) to give Mexico’s National Institute of Statistics and Geography (INEGI) direct reception of U.S. Landsat 8 satellite data. Joining Secretary Jewell for the signing and announcement were Eduardo Sojo Garza Aldape, INEGI President, and Carlos Agustin Guerrero Elemen, INEGI Director General of Geography and Environment. Secretary Jewell delivered opening remarks today for the GEO 2015 Ministerial Summit focusing on climate data, transparency and highlighted information-sharing among international partners to help countries make informed, sustainable land management decisions in the face of a changing climate. She also led a variety of working sessions designed to produce commitments on open data and transparency, especially as it relates to sound science and information sharing to aid in landscape level planning for development and conservation. The U.S. has provided open access to its satellite-derived science and meteorological data for decades. The Department of the Interior and USGS work with the National Aeronautics and Space Administration (NASA) to provide continuous data on the Earth’s land mass, coastal boundaries, and coral reefs through the Landsat series of satellites. The currently operating missions, Landsat 7 and Landsat 8, capture more than 1,200 images of the Earth’s surface each day for U.S. and foreign archives. 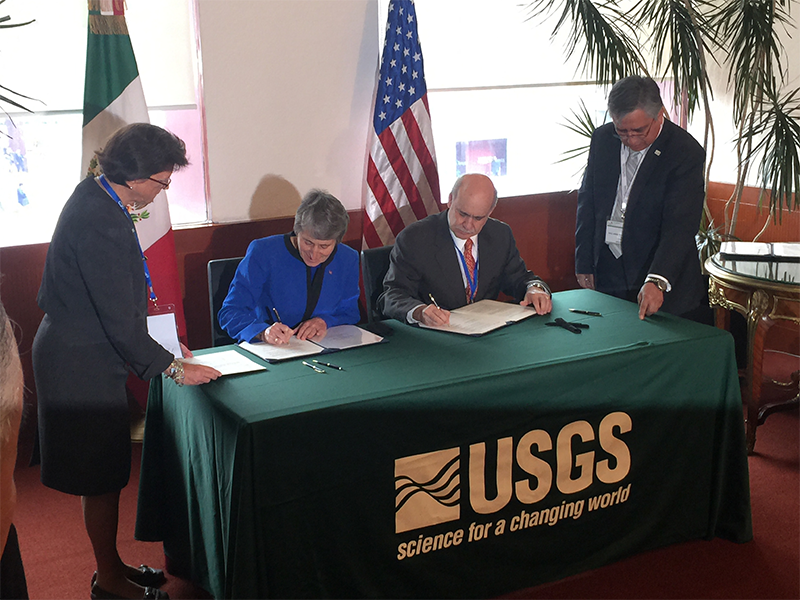 Through the MOU, USGS will program satellites to transmit remote-sensing data to the INEGI ground station, enabling INEGI to capture and process the data into useful images of the landscape. Information derived from such imagery provides a wide variety of societal benefits in areas including agriculture, geology, forestry, education, regional planning, mapping, and global change research. Landsat’s spatial coverage and moderate resolution make it uniquely qualified to study national-, regional-, and global-scale environmental changes. Discussions with INEGI regarding its interest in a Landsat 8 ground station and the related agreement have been ongoing since mid-2011, but issues with the receiving antenna system in Chetumal led to delays and to other considerations, including a possible site near Mexico City. Recently, internal INEGI decisions have been made to move forward with the L8 ground station in Chetumal once again. The USGS has authority from the State Department to negotiate with foreign governments and international organizations to conclude multi-mission MOUs for International Cooperator (IC) ground receiving stations. Since 1972, Landsat missions have been an important component of U.S. foreign policy and science and technology policy. In foreign affairs, the program’s longstanding network of International Cooperators (ICs), which operate numerous ground stations, embodies the United States’ policy of peaceful use of outer space. Established in 2005, GEO provides a forum for international coordination of Earth observation assets and strategies. Some 96 nations, the European Commission and 87 international organizations are participating in the current summit. GEO is co-chaired by the United States, China, the European Commission and South Africa. Top priorities for GEO include addressing challenges of agriculture, biodiversity, climate, disasters, ecosystems, energy, health, water and weather.